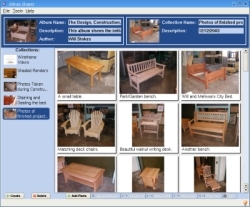 Album Shaper is a graphical application used to create, maintain, and share photo albums using open formats like HTML, XSLT, and JPG. Two-layer albums can be created in a drag-n-drop interface which allows quick and easy arrangement and catagorization of photos. A few simple image manipulations such as rotation and flipping are provided to help you get your photos presentable as quick as possible. Photos, subalbums, and albums themselves can be labeled as needed and modified at a later time by saving and loading from a simple XML format. Albums are exported as HTML which can then be posted directly on the web or viewed straight from your hard drive. Help us build the largest freeware directory of free software downloads by submitting your downloadable freeware today. Find more listings like Album Shaper by browsing the freeware category Utilities.